I’ve mentioned (a few billion times) that my local friends are feeding my family until the remainder of my bed rest sentence ends. Kindest thing EVER. Well, last night one of my homegirls came over with… THIS. A stuffed artichoke. 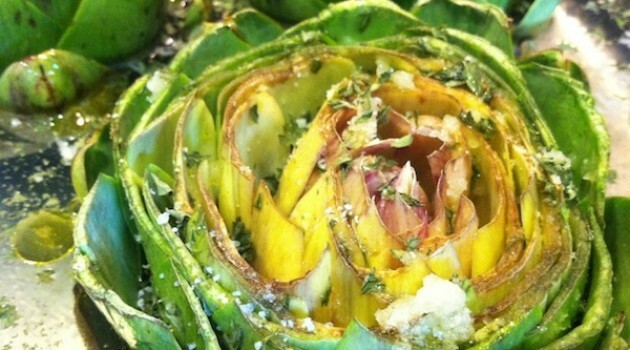 A delicious, filled to the rim, saucy, delectable artichoke. She made us a regular dinner and then offered up two of these puppies as an appetizer. Are you freaking kidding me? I ate the whole damn thing. It was oh SO good. I make artichokes all the time. But my version is from my grandmother and is MUCH healthier than yesterday’s meal. My version should be for your weekly dinners. BUT the one I had last night should be used for a special treat. And boy did I enjoy it!!! 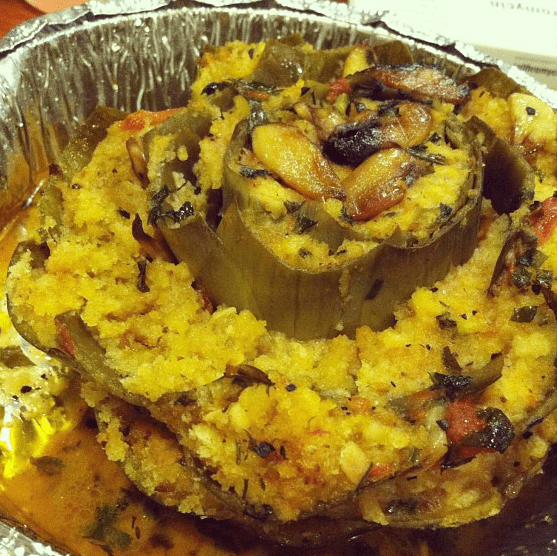 Do you have a local Italian restaurant that offers up a stuffed artichoke like the first shot above? Have you tried it? Do you bathe in it like I do!? LOL!! !